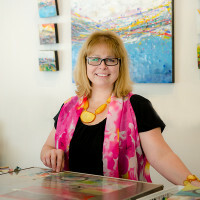 ﻿ Gayle L. Curry – Encaustic Artist, Colorist, & Abstract Impressionist. Encaustic Artist, Colorist, & Abstract Impressionist. Painting with encaustics (wax) is an ancient art form which is enjoying a resurgence in the last few years. The wax, which is beeswax and dammar resin crystals melted together, is coloured with dry pigment or oil paint. It must be kept hot (about 200 degrees) during the painting process. It is applied with bristle brushes in layers to an absorbent surface, such as birch wood panels. The layers are fused with a heat gun or propane torch. The word encaustic comes from the ancient Greek, meaning to burn in. Encaustic Painting was practiced by Greek Artists as far back as the 5th century BC. Legend has it that the Greeks applied coatings of wax and resin to waterproof their ships, and that this led to pigmenting the wax for decoration. This glazing process allows a depth and richness of colour to be achieved. I love the extraordinary effects of depth and luminosity that can be achieved, the wonderful sense of transparency that you can play with, and the richness of textural possibilities. What I enjoy most is the involvement with the process itself. The sheer love of beautiful natural materials, the completion of the process by sealing it with fire. Encaustic Artist, Colorist & Abstract Impressionist.